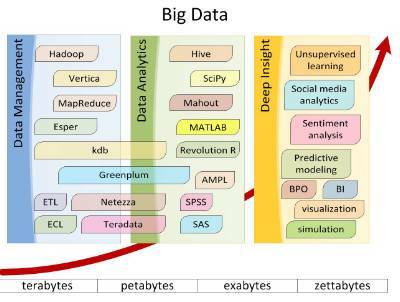 Brimstone Consulting Recruitment Specialists, What is Big Data? Below and on the additional pages in the side bar menu is an introduction to Big Data and Data Analytics/Analysis. This may be useful if you are new to recruiting in this area. Big data is the term for a collection of data sets so large and complex that it becomes difficult to process them using on-hand database management tools or traditional data processing applications. The challenges include capture, curation, storage, search, sharing, transfer, analysis and visualization. The trend to larger data sets is due to the additional information derivable from analysis of a single large set of related data, as compared to separate smaller sets with the same total amount of data, allowing correlations to be found to "spot business trends, determine quality of research, prevent diseases, Legal Citations, combat crime, and determine real-time roadway traffic conditions." In a 2001 research report and related lectures, Gartner analyst Doug Laney defined data growth challenges and opportunities as being three-dimensional, i.e. increasing volume (amount of data), velocity (speed of data in and out), and variety (range of data types and sources). Gartner, and now much of the industry, continue to use this "3Vs" model for describing big data. In 2012, Gartner updated its definition as follows: "Big data is high volume, high velocity, and/or high variety information assets that require new forms of processing to enable enhanced decision making, insight discovery and process optimization." Additionally, a new V "Veracity" is added by some organizations to describe it. Big data uses inductive statistics and concepts from nonlinear system identification to infer laws (regressions, nonlinear relationships, and causal effects) from large data sets to reveal relationships, dependencies, and to perform predictions of outcomes and behaviours.